An inflammation of the mucous membrane of the paranasal sinuses caused by pressure difference within the sinus relative to ambient pressure, secondary to the obstruction of the sinus ostium and occurring during a descent or coming down in the altitude. 1. The inflammation of the lacrimal duct and ethmoid sinus. 2. The inflammation of the lacrimal drainage system in association with ethmoidal sinusitis. 1. To hint at something unpleasant or to suggest it indirectly and gradually. 2. 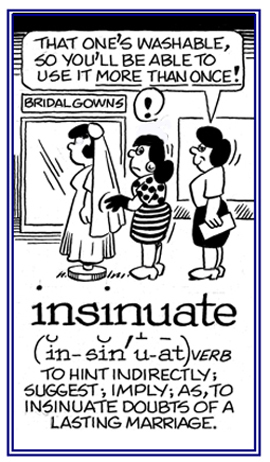 To introduce oneself gradually and cunningly into a position; especially, a place of confidence or favor. 3. To suggest slyly: Shirley insinuated that the boys were lying. 4. To introduce or to insert (oneself) by subtle and artful means. 5. Etymology: from Latin insinuatus, insinuare "to bring in by windings and curving, to wind one's way into"; from in-, "in" + sinuare, "to wind, to bend, to curve", from sinus, "a curve, a winding". © ALL rights are reserved. Referring to provoking gradual doubt or suspicion; suggestive: She made insinuating remarks about how unreliable the speaker is. When anyone describes someone's words or voice as insinuating, he or she means that a person is saying in an indirect way that something bad is the case. Relating to the tendency to gradually cause doubt, distrust, or a change of outlook often in a slyly subtle manner. Descriptive of trying to gain confidence or affections or having the power to gain favor from someone. Someone who makes hints about something that is going on but who is not detailed. A sinus infection or an inflammation of the air cavities within the passages of the nose: Physicians prescribe antibiotics if bacterial infection is indicated. The removal of the diseased membrane of all of the paranasal sinuses on one side of the nose. Inflammation of the nose and paranasal sinuses. The diseases of the nose and paranasal sinuses. To curve, to bend, or to wind in and out.